There are thousands of sites offering information about international arts activity on a daily basis. One of the most varied and cross-media is artdaily.org. I subscribe and they deliver a news summary every morning. There is frequently great photographs such as this image by Vincent Yu of a 13th century Nepalese gilt copper figure of Tara on show at Sothebys in Hong Kong. 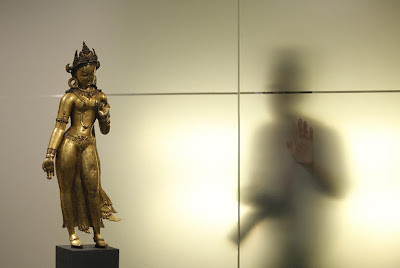 The coverage of Asian art - both historical and contemporary is exceptional. Recommended.